Posted on Wed, Jan 18, 2012 : 4:05 a.m. 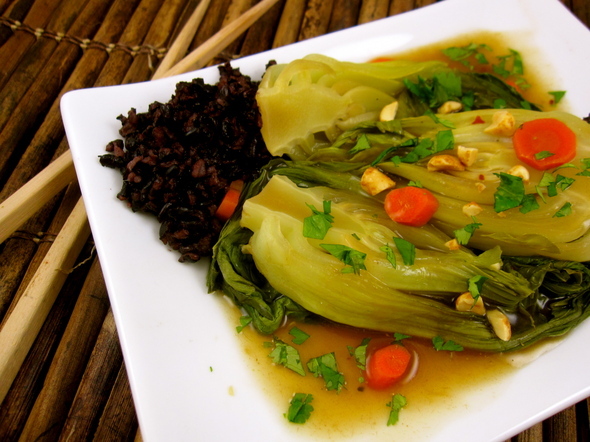 Here's a healthy, (almost) vegetarian recipe to usher in the Chinese New Year on Monday. When I'm craving food with a lighter touch, I often turn to braising or steaming. I didn't use so much as a drop of oil when making tonight's dinner. Braising bok choy and carrots. I used carrots in the recipe because, basically, they need to be used, but peppers and scallions would be a fine substitute. The black sticky rice I paired with the dish was purchased at Spice Merchants in Kerrytown. My main regret with the recipe is I didn't have shiitakes to add; their flavor is marvelous when paired with oyster sauce. I make another recipe similar to this that incorporates tofu, if you'd like a punch of protein in your dish. 2. In a small bowl, whisk the vinegar and cornstarch until smooth. Remove bok choy from stock and then whisk the cornstarch mixture into the seasoned stock; stir in red pepper and ginger. Continue to simmer until mixture has thickened. Reheat bok choy in the sauce. Serve bok choy with rice and sauce and sprinkle dish with chopped cilantro and peanuts, if using.